Nothing is as difficult as true theology. Simply saying something correctly is beside the point. Correctness does not rise to the level of theology. Theology, rightly done, is a path towards union with God. It is absolutely more than an academic exercise. Theology is not the recitation of correct facts, it is the apprehension and statement of Beauty. Words have a divine origin, having preceded all of creation. They have a right relationship with every created thing. Just as in the beginning, every word brought something into existence, so every word, in right relationship, reveals creation to be what it truly is, and in so doing, makes God known, even present. Theology looks for the words, in the right relationship, in the right order, at the right time. Written, spoken, sung, carved, inscribed, printed or lighting a digital screen, they share and commune the relationship, in the right order, at the right time to the right one. Sometimes a single word suffices. But every word has its own meaning or expresses and carries the reality of a thing-in-relation. All of creation is the words God spoke and speaks and waits in expectation to be heard. And this is the task of theology: to hear the words God speaks and write them down. These are counter-words, non-words. Words that abuse: “God; said; you; eat; tree; garden.” The right words, in the wrong order, to the wrong person, at the wrong time. A death of theology, or a theology of death. I break here for a more prosaic set of thoughts. Writing theology, in whatever manner, must always strive towards repeating the words of God. There are many things that use “God-words.” Sometimes they can even be the words of the Creed or Councils or beloved Fathers. They can give life or they breed death. They can lift up or crush. I frequently encounter a form of spiritual abuse: the use of true words to do untrue things. Words never stand by themselves. You cannot simply place them before someone and proclaim: “The text says!” That a statement is “true” can also be used to pretend that its every use is justified – that truth “de-weaponizes” any statement. Tragically, the very truth of a statement can give it the power that makes its use as a weapon so devastating. The reality is that “truth” wielded in such a fashion ceases to be the truth. When Christians appropriately observe that “truth is a Person,” they should recognize that this extends far beyond the recognition that Christ Himself is the Truth. It should recognize that mere factual truth is insufficient. It is relational (a fundamental reality of what it means to be Person). It must be the right thing in the right way at the right time, etc. In short, this is the union of truth and love. For the Christ who is the Truth, is also the God who is love, and they cannot be separated. Theology, at its most profound level, participates in this same movement. It reveals, through the shared word, the good work of God. In doing this, it invites the one who understands to participate, through self-offering and acceptance, in the life and work of the good God. And that is true beauty. Thank you Father for a thought provoking post. As I read your words about Christ being both Truth and Love I was strongly reminded of Saint Paul’s words in 1 Corinthians 13. The Truth spoken without Love is not of God but only a pantomime of God and, as you say, often a weapon of great destructive power. I do Pro Life ministry and have the misfortune to witness some people use God’s word as a weapon of hate and division. This small group is the only people I have ever heard that can read Scripture and make it sound like hate speech. I pray daily for a spirit of reconciliation and peace to descend onto this nation and cause us all to speak peace to one another. this article flows like some heavenly poem. This helps put into context my disdain for so many “truths” that were presented in my past with harshness and an evil delight in condemnation. It is very easy to over-compensate for the acts that accompany the words by abandoning the truth of the words altogether. I guess that is why “Jesus loves you” was always anything but a message of love for me. You worry me. You’re starting to write like those close to death who can see the angels approaching. That’s good. Except, I’m not ready to lose you yet. Well, my doctor says that all is well, so, nothing pending. 🙂 Of course, keeping death ever before your eyes is essential to living well. Drewster, death to the world does not require physical death. I agree, but it is often so. How few allow the “old man” to die while they still feel any confidence of avoiding the clutches of physical death. These words are so true Fr Stephen. Words I should remember when I participate in this blog. Nicholas, sometimes I see media (news reports in video) that show people who use bible verses in a verbal attack of women going into an abortion clinic. The women appear victimized by this. Are you present when such things happen? If so how does one deal with this? Are you able to engage in different ways that doesn’t make you look like the others? I ask this because I’ve been challenged on this topic and ended up not engaging further because my words seemed to be taken as an attack which was not my intention. Unfortunately, there is a minority of folks who behave this way towards women who are going into the Planned Parenthood facility. The rest of us have tried to have reasonable conversation with the few that behave so badly, so far we have had little impact. Fortunately, they are not there all of the time. In my experience the best method of engaging those entering is to express compassion for their position and offering help so that they are not forced to abort their babies. The truth is that the women who go through with an abortion suffer terrible psychological and physical trauma from abortion and my approach is to try to get them to go to the CPC that is literally 50 yards away. When a woman shows up at the clinic she has already found herself between a rock and a hard place and has no easy out in front of her. PP tries to say that what they offer is the easy way out but that is a lie. Hopefully, if offered help, a woman will make the life affirming choice to continue her pregnancy and either keep and raise her child or allow the baby to be adopted by people who genuinely want them and will love and care for them. Our Bible thumping minority also attacks other Christian groups that do not share their particular brand which is even less helpful. Satan is truly there and we do stand at the Gates of Hell. There are no easy answers or surefire solutions. There is only kindness, love and stubborn perseverance to hang on to. Thank you, Father. I’ve been struggling to understand the posts you’ve written on shame, but I related to your words today. These words made sense to me. I’m not sure if what I’ve just said makes sense, or where my lack of understanding comes from in reading about shame. All I can do is pray. Thank you Nicholas. I’m glad you shared what the alternatives are and how you approach this. Thank you for the work that you do, in all the difficult ways that you might be placed in these circumstances. This note will seem repetitive with the other I wrote which is in moderation. — a glitch related to my software. Thank you for your response and the good ( in truth and love) work that you do. Drewster, I think part of that is natural. The older we get the easier it is to see folly because we’ve engaged in it so often. In my few of 63 years, shame has encompassed me, both inwardly and outwardly. Confession to a listening and compassionate priest has been very helpful. But, again, loving others in the biblical way (respectfully and as persons unique and fashioned by God) is many times hard because of my own shame: I want to view someone as less than I am, thus, giving my ego/self-rightness a boast. I will continue to stumble and strive towards my relationship to the Truth, which needs to grow. Again, thank you. My heart is broken for all those who go through an abortion because I know so many personally and I know the trauma they live through daily. Make no mistake, there is plenty of resistance from those we are trying to help. They often hurl swear words at us in response and some threaten violence. A few months ago one threatened to shoot us. It is amazing what can and does happen but such is the cost of speaking truth in love to the forces of darkness. Thanks for sharing the quote. Fr. Alexander is/was an important voice in contemporary Orthodoxy in America. Even those who criticize him (who generally have little knowledge or understanding) have little appreciation for how much in his debt they are. The criticism about language is somewhat sad. I have been occasionally taken to task (elsewhere) for somehow not writing in the voice of the fathers, or some such nonsense. Anyone who actually wants to communicates has to do so in the language of the people to whom he speaks. Most of the Orthodox that I see who use lots of patristic terms and quotes, generally don’t really understand what they mean, but imagine themselves to understand. “Nous” is a very good example. I would suspect that “virtue” would be another. I contribute a significant number of articles on the meaning of words, precisely so that we can actually understand and live the faith we have been given. Just “talking” or “writing” in some sort of patristic pastiche is worse than sad. It actually mocks the fact that the fathers borrowed the language of their own time and culture, particularly the vocabulary of Neo-platonism and Stoicism, and adapted it to their own use. Sometimes they changed meanings out of necessity. But they did not create a Christian patois that would have been jibberish to their own audience. They were teachers. Good ones. Today we have critics. Bad ones. Many of the critics have made no positive contribution to the Orthodox faith other than to make it unpleasant to say anything in a public setting that doesn’t conform. Father, commiserations on the “withering conversations”! I read former abortion clinic director, Abby Johnson’s biographical story a few years ago. It was the kindness and prayers of a group of prolifers like Nicholas’ group who faithfully worked for years outside the clinic she directed that enabled her conversion and repentance. You can read about her inspiring story and ministry to others working in the abortion industry at her web site: abbyjohnson.org. Your comment is right on!! As I am getting older it seems like so much of what once seemed so important to me and so many things that I did that I took so seriously was in the end … folly!! But rather than than despair it seems like this is teaching me me the importance of repentance, not to take myself too seriously, gratitude and most of all to rely on God’s mercy. She came to Columbia to speak at a Pro Life event last year. We also try to direct the workers attention to her website (which is on one of the signs) so that they may break free of their environment. When I did Pro Life in Mississippi a few years ago, the lady who owned the CPC clinics in Jackson would come to the abortion mill just to offer the workers employment because she also owned a very large Home Healthcare company. She would bring applications and was very successful in hiring away the employees from that place. The only think that works with either the workers or the victims of the abortion industry is loving kindness. The people who do the best in the Pro Life effort are those who show the most compassion even to the post abortion women. They need help as much as the women going in. What matters is persistence. Not all of us are gifted in engaging the people going in but the sight of the rest of us in prayer moves many of those contemplating abortion to change their minds. If one cannot go down to a clinic, prayer at home is also very helpful. Thank you so much for your good work, Nicholas. I have relatives who, decades after the fact, experienced substantial healing post abortion through CPC, and the wife volunteered for several years at the CPC after that. My prayer also is that, in this age of heated and polarized rhetoric, those who believe in Christ, would truly believe–that is, that they would understand how truly powerful weakness, meekness, gentleness, longsuffering, radical lovingkindness, and the vulnerability of the Cross really are, and rely on that, and that alone to do God’s work. You are correct, the real power is the kind that Christ displayed not only throughout His earthly ministry but on the cross. I do not stand alone in the trenches and there are many who are far more effective than I am at ministering to people at the clinics. My prayer is for more to become involved, directly through coming out or by working in a CPC. We also need indirect support through prayer and through careful voting to get the Pro Life legislation passed to curb this industry. The real solution, however, is for people to see abortion for what it is and repent from all the factors that lead up to entering a clinic. Thank you Karen for the link! I’ve started reading the material on her website. Also I want to affirm what you said Nicholas about the need for kindness and compassion. Among the people who are family and friends around me (and what I had believed too) Christians are a hateful people whose espouse the words of God and love but exhibit anything but that. Their vigils outside of clinics are seen as a type of bullying rather than offers of help. It’s been difficult for me to attempt a conversation on this topic without getting into hot water quickly. What you said about the factors that lead a woman ( or girl) to seek abortion., is seldom addressed in what I’ve read. I would like to see more attention to those factors in conversations and prayers. Thank you again for your work, Nicholas. I, too, notice the rhetoric and the hatred spewed by some who style themselves as Pro Life Christians. There seems to be a segment of people who have the form but none of the godliness of the faith. This spirit was present in the Reformation as Europe was laid waste and 1/3 of its people killed in the Wars of the Reformation. I cannot help but think this is due to the legalistic/forensic view that became prevalent in the Radical Reformation movement. I think that spirit lives on today in some. Not only does this appear in Pro Life work but also surfaced in the on going flap over Hank Hannegraaf’s conversion. Re: the hateful words and deeds of Christians (so-called). I do believe in most cases these are weak-minded people misled by false teaching and example of others because of the passions, and in all cases such activity is prompted by the devil. But I have recently discovered several American-born sects such as Mormonism, Jehovah’s Witnesses, Seventh Day Adventists, and even The Salvation Army were founded by people who were Freemasons themselves or heavily influenced by Freemasonry, which is occultic. It is also coming to light in our day the extent of the generational involvement of European and American aristocracy in the occult. In a lot of cases, families heavily involved in the occult are also members of mainstream churches or a mainstream religious tradition and leading double lives, so it has now occurred to me to ask to what extent this might have been the case with aristocratic patrons and leaders of the various movements in the Reformation as well. I just came across information about Zinzendorf, who was the leader of the Moravians, that show him to have had such a double side, with the darker one leading his followers into a spirituality that involved communal sexual immorality and fetishism focused perversely on the wounds of Christ that would rival any modern abusive cult. In my opinion, that is a sign of Zinzendorf’s covert involvement in the occult (he was a Count). All that is to say at the highest and founding levels, this m.o. on the part of a religious group or sect may actually indicate purposeful occult infiltration and intentional subversion of true faith. All this does not change our own calling and ascesis as Orthodox believers. It just helps me to be more aware than ever that our battle is not against flesh and blood, and our weapons cannot be carnal either. You are mentioning the darker specifics of what Father Stephen refers to when he says that Western Christianity is secularized. I once interviewed for the pastorate of a Methodist church and discovered that all the members of the search committee were active Free Masons. Add to that the scholastic theology in the West which is based on Neo-Platonic and Aristotelian principles which are pagan. The Penal Substitutionary Atonement model is based on the work of Anselm “Cur Deus Homo.” Much of what Anselm attributes to God are pagan ideas of the nature of the divine, the most heinous being His honor that is offended by us. The picture painted by Anselm is a petty Germanic King who is a tyrant. When I discovered these things in my Seminary education and experience in the Protestant world, it made my conversion to Orthodoxy essential. Now that I am becoming Orthodox (it is truly a long process) I see even more. Just yesterday I made the connection between the Gnostic rejection of the Eucharist and the refusal in Reformed thinking to accept the Body and Blood of our Lord as real. I have also observed the many similarities in many Protestant beliefs and Islam. Thank You Lord for calling me until I finally answered. I personally know a few Orthodox who are Free Masons too. It’s not just a Protestant phenomenon. As Evangelicals we were taught to shun the Masons and any type of secret oath taking. How do you personally cull the truth from the false on the internet? So much of so-called history is nothing more than added conspiracy theories. The internet is getting crazier and crazier. I shun conspiracies – mostly because the people I see who get caught up in thinking that way seem to get stranger and stranger. First, we should not read history in fear. Nor should we read the news in fear. No fear. Second, get grounded in a proper Orthodox narrative. Ignore politics as much as possible – it’s largely beside the point. If you’re reading Orthodox material that seems primarily concerned with criticizing the Church or its leaders, stop it. It’s not that we’re without sin or without problems. Only that there’s more problems in those who spend their time warning and fixing and exciting alarm. Third, mostly pay attention to your own soul. Read stuff that draws you to Christ and that provokes true repentance. I will point out one of the rules on my blog: I do not criticize Orthodox clergy nor do I allow others to do that. There have been any number of scandals in the 11 years or so of the blog. Ignoring them has been the wisest thing I’ve done. And they have largely passed, as will those of the present. If someone thinks that this approach is naive and ignores real dangers – I would point them to my articles concerning not being in charge of history. You either believe in the Providence of God, or you don’t believe in God. I don’t worry about Freemasons. They are not today what they once might have been. Mostly they build hospitals and ride motorcycles. It’s not that there is no critique about secret oaths and such – but the alarms and cabals that many repeat today are very often as bizarre as the stuff they imagine to be going on. The Reformation had lots of nutty stuff. Iconoclasm in its many forms breeds craziness. Oddly, and ironically, there are versions of Orthodoxy that get caught up in reforming madness in various ways, and it produces some of the same strange fruit. And here by “reforming madness” I’m not referencing the Left or the Right – the madness is an equal opportunity thing. Thank you for this very helpful and concise reply. You are a rich blessing. I will practice what you have laid out. So do I know a few Free Masons who are Orthodox. I know it is not just a Protestant phenomenon, but that does not make it right. I studied under a PhD in Seminary that made extensive studies of other belief systems and he had quite a bit of written material that was Masonic (he has a PhD in Comparative Theology). What is shocking is what they really worship. When one becomes a 33rd level Mason one learns the true object of their worship. Let’s just say that the Masonic worship and Christian worship are diametrically opposed to one another and people who are trying to be both are working against themselves. Fr Stephen thank you for your wise words in your response to Dean. I believe I get drawn in to unfruitful conversations about the politics and geopolitics of self described Christian groups, partly because my family are fearful about and wish to dissuade me from my faith. They read/listen to the news and it does upset them. 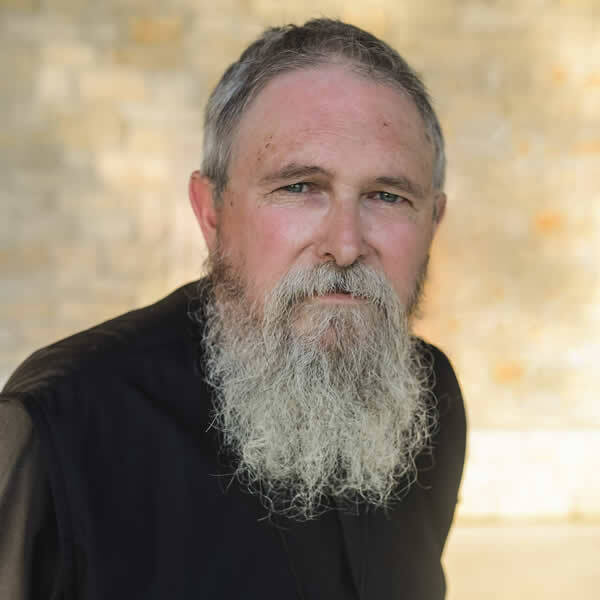 Also, I heard in one of Fr Seraphim Aldea’s podcasts that he refuses to talk about abortion because he perceives it to be a political issue, and he doesn’t want to get drawn into it. I believe he may be correct. But I wonder how one might help without getting drawn into it. Perhaps it is only through whom one might encounter in ones daily life. We are not called to be silent – there are far too many examples in Orthodox history to the contrary. Neither, however, should we be mistaken that speaking and acting will change things. By God’s grace and mercy, things might change. And they do. We speak and act as it seems we are called, according to our gifts. The results of our actions, however, are in the hands of God. When we begin to think otherwise, then we begin to entertain violence as the solution to evil – it is not. Along with my parish, I participate in the March for Life each year. We are also very involved in support the local Crisis Pregnancy Center (pro-Life) that provides support for women in difficult situations. If we see a victory in our culture, it will be because we “out loved” our adversaries. Thank you Fr Stephen for your response and clarification. My hope is that I discern God’s calling, rather than prompts from my own pride or sense of self righteousness. It seems to be easy to fall into such traps. As you have mentioned in the past, self emptying and humility is key. Re: Freemasons. According to claims of some former Freemasons, only 1 in a 1,000 or so Freemasons will be actively involved in the occult and the more secret activities of these societies. Yes, there are many in Christian churches (even Orthodox) who will become superficially involved in Freemasonry mainly for the social and business contacts. My own grandmother (who was a devout Episcopalian) and great grandfather were Masons (but, as my aunt put it, Grandma was “not a joiner”, meaning she was only superficially involved). My husband and I once attended a wedding reception for a work colleague of my husband’s that was held in an Elk’s Lodge. The Elks are just a variation (all of it collectively can be loosely be called Freemasonry). I also attended a high school friend’s installment as a member of “Job’s Daughters.” Even that brief high school experience and more recent reading of the Lodge’s stated purpose and objectives posted on the wall at the Elk’s Lodge made evident the Gnostic-like elitism that pervades everything they do. The rituals and community philanthropy in which these organizations engage just seem like counterfeits and substitutes for genuine Christian Liturgy and true almsgiving, and, yes, I believe it would be hard for a spiritually sensitive person who understands the gospel to miss that the secret society mindset is the very antithesis of the mindset of the Cross, of the bearing of our shame. Seeing as the street grid in the heart of our nation’s capital is laid out in Masonic and occult symbols, I don’t necessarily agree Freemasonry is on the wane, although its occult influence may be more pervasive in Western societies in less obviously “Masonic” forms than it used to be (except maybe for the initiates who know what to look for). The Shriners certainly are as present as they ever were in my local Memorial Day and July 4 parades in their funny hats and on their funny little bikes and scooters, and through their annual children’s charity fundraisers, and their headquarters building in the local suburbs here in which our local technical school held their awards/graduation ceremony (in which my son was honored when he graduated high school) is certainly pristinely maintained and richly and elegantly appointed. There is indeed a lot of crazy stuff out there, and I don’t suggest we go looking for these things. It is very dangerous (and unscriptural) to go seeking out the details of the activities of occultists. I quite agree with the guidelines Fr. Stephen offers. My main concern in mentioning what I did here is to remind us of where the real struggle is. That is to say, it is not with our human brothers and sisters, no matter how appalling their behavior or words. What we can do, as Father Stephen says, is to speak out. In my experience that means deal with the women in crises in a loving and helpful manner. What I do not do is attend “Protest” rallies, display gory signs, or pressure representatives for a political solution. Politics and laws will not “solve” the problem. That is attacking the supply side of the equation and like the “War” on Drugs it will not stop anything. What needs to change are hearts. We can and must be active in helping people to be disciples of Christ to change their hearts away from selfish and destructive behaviors as the Lord works on them. Indeed – hearts must change. The percentage of Christians (Orthodox, Catholic, Evangelicals) who have abortions is almost the same as the culture at large. It’s not “us and them.” It’s us. What is truly heart breaking is the number of people I know who are Orthodox and of Russian descent who experienced mandated abortions during the Soviet era. For a woman to lose a child is one of the most devastating emotional blows a woman can receive. An abortion makes it a worse experience and a forced one even more devastating. These are hearts who truly need loving care and healing. There are wicked people in high places–not a surprise. People follow after heresy and call it the truth– not a surprise. There is a saying: bishops die, babuskas live forever. The impact of Masonic thought today lies in the egalitarian notiins that all faiths lead to the same god. The statement of Jesus that only by Him shall we see and know the Father. There is no Church or faith that can rightly claim the truth. That fits in quite nicely with the nihilist modern agenda. It is both seductive and destructive. Wow! Talk about an “open season” on such a wide field of topics that ALL need important clarification and yet…it all started from–theology? When you come in on these posts and read the article and then all the comments that follow, you get blown away at how fast we digress and plead the seemingly infinite topics (fears?) 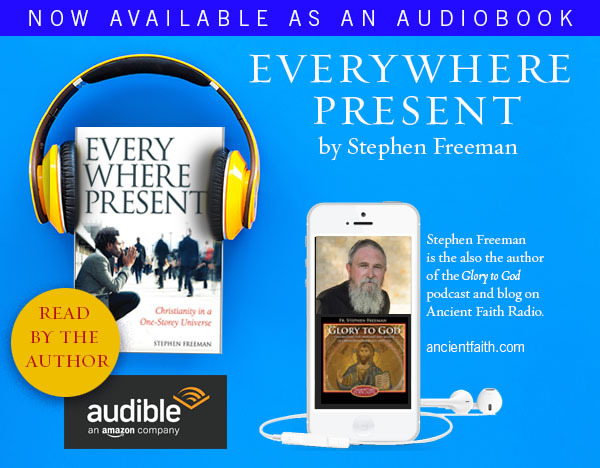 that follow such a profound revelation shared by Father Stephen. I say, Yes! We all need to intercede and ask in earnest prayer for Fr. Stephen’s protection. I am beyond words in describing my similar experience as noted by you above, of what is being shared here. There are untold thousands who are being blessed by what God is choosing to share through Fr. Stephen’s insights and it is our calling as regular readers of this blog to pray for Fr. Stephen and his ministry. Drewster, please know I read this post with the same shudder and tingling of awe. I do not share in the dissipation of your important observation into a more generalized interpretation of supposed “wisdom” of those who are with years. This is much, much more than that. Thank you for your insight! Please Father, re-direct us to what you are trying to help us see in this seemingly distant insight on theology from your lengthy string of articles on shame. It seems to me, though I am blessed with “many years” that I am missing the quantum jump here. For those of us who use “God-words” (in our work, our writing or whatever), this is a true but chilling notion. While there are some people that I do not doubt intentionally use “God-words” in service of evil, certainly there are many who sincerely (even if wrongly) believe that what they doing is “lifting up” and “giving life”. Their words are in the wrong order, etc. but they do not recognize it. This raises the question: how do I know that I am not one of them? How does any of us know? Pray. Practice humility. Pray for more humility. Above all, strive to do all things with love. What else must we do, short of keeping silent? Thank you for writing these true words, as uncomfortable as they make me. I share your comment “this raises the question, how do I know I am not one of them” But I have read your blog – it seems to me you are giving encouragement. I recently turned off my feeds on social media from sites/ bloggers sharing quotes from the Holy Fathers (with the exception of Fr Stephen and one or two monasteries). There were bloggers/ sites that were quoting / sharing words that are life giving and that are encouraging – except that I recognized that the words they were sharing are from Saints who are in such an exalted spiritual state that “I” was not ready for them. Or – more importantly, that I need guidance to spirituality metabolize them. They were words that are “too great and too marvelous for me”. Not only that – the quotes were in such abundance. Vitamins for the soul – yes, but too much for one day. Before Great Lent I just had to stop reading it all. Just every day interactions reveal my unworthiness and inadequacy, how much more so when I read something I should not read from , say, the Philokalia. There can too much of a good thing – like reading spiritual sites on Instagram Feeds or Facebook – and you are getiing so many words of encouragement – all of those words stemming from hearts far more enlarged than my own -and that can give a person a case of spiritual indigestion (like eating too much candy – because those words are sweet). That can feel like death because they are words from Saints who have lived a lifetime of repentance whereas, I certainly can not claim to be repenting in such a way. So we read something which is absolutely Life giving and encouraging, but we can’t metabolize it because we haven’t activated the enzymes of repentance in our own life. We sometimes assume God is irrational –since we humans invariable are so in our criticisms – while God simply invites us to apply the words of the saints according to our setting and not theirs. But we must be focused on the loving God, not on us, not on other humans… So, depending on the specific “cards you have been dealt”, you are expected to try and do what is at hand, not more or less; you cannot play a different game as that would simply be unrealistic. So, one who has been called to be a priest in a priest’s family will try to fulfill the two commandments of love in a different way to one who [to use a fairly extreme example] has been born in some abusive, satanist family, or to another who has been called to this life with the special ‘calling’ to be, say, a paralytic. But nobody is lacking in possibilities to demonstrate some of their love and trust in God and neighbour no matter what their situation. It will obviously look unrecognisably different and we could not compare or judge any of this ourselves. Everything you wrote IS very encouraging. Thank you…. I think there is much wisdom in what you are saying. It is easy to fall into a sort of spiritual “greed” or “gluttony” – I have certainly done so myself – in which we feel that, if something is good, more must be better. Hence, we try to fill ourselves with more books, practices, etc. that we can possibly be ready for. I often want to read *more* rather than simply be still and meditate on one line of Scripture or one wise saying. Why? Because I fashion myself much further ahead on the spiritual path than I actually am. And because I am accustomed to a world in which competition is glorified – so being “ahead” is deemed better. Humility, which you are describing, is the foundation for all of the rest of our spiritual growth. God is helping me develop an “appetite” for it. My ego resisted for far too long but now I am starting to appreciate its sweetness. I found it interesting that my priest forbade me to read both The Ladder of Divine Ascent and the Philokalia when I first joined the Church. (And he has not yet given his okay to read them). I obeyed, not really understanding why. I can now see that I really cherished gathering information (a habit from my, rather pride-driven, Protestant days) and I needed (and still need) to learn to live in an Orthodox manner as opposed to “knowing how to do so” (and invariably wonder why “that guy over there” wasn’t doing it!). Practice humility indeed! I can see his wisdom in hindsight. It is amazing what words can do. Personal experience: I has a brief but intense conversation with a woman classmate of mine in college (over 40 years ago) about pre-natal surgery and it’s relation to God’s will. I was not a Christian. However, she spoke so knowingly about God’s care for us no matter the circumstances that it moved me in the direction of Christ. I still vividly remember the conversation but I long since forgot the woman’s name. The words she spoke made God a bit more real in my life. That bit of reality has never left me even though theologically she was wrong–coming from a Calvinist predestination mentality. Great story, Michael. Although I would say the woman was both right and wrong. Some of her “theology” was in error but she was quite right about God’s care for us – and it was that that apparently made the difference to you. Thank you everyone for so many helpful thoughts and insights! I really appreciate your question of how do I know whether I use “God-words” in the wrong places. I am surrounded by very loving evangelical Christians who preach their love and many concerns while in public prayer. I grew up with this and it can be very offing as participants can be taken as telling God instead of asking. But I have learned and am still learning to grow “ears” to hear what they are actually intending instead of judging their content. I now hear forms of liturgy that I think their soul, as my soul has definately done, is yearning and crying out for more meat, more of the eucharist which is so lacking in substance. I often think that many of these prayers are the “unspoken” requests of their hearts while dealing “with the card they have been dealt” as Dino so carefully pointed out above. …of being in our criticisms. WOW! that hit home. I definately see the criticism aimed back at me rise as I am less and less merciful…in my thoughts; which I wonder at being words in their “pre-natal” care as Michael Bauman shared above. Just as I experience a huge amount of “wrong theology” which has really become the death to theology in many, many of the evangelical communities I come in contact with, I must say and confess to a tremendous uplifting to so many, many loving and caring hearts that pour out an unspeakable amount of funds and prayer to the needs of people literally…everywhere! So there is something about “right” theology that seems to miss it’s mark in the hearts that are none-the-less reaching out and touching lives…. on metabolizing spiritual content…and quotes in such abundance, but had to stop reading it all…. I have been meaning to ask…what is this strange picture? It looks like something from a work of sci-fi fantasy . It’s a Hubble Space Telescope picture of something out there…Amazing photos, always. I did a quick search: I think it might be the “Pillars of Creation” in the “Eagle Nebula”. Awesome pictures. Those are, in fact, the Pillars of Creation. They are part of a gas cloud 6000 to 7000 light years away. The Pillars are unimaginably huge, far beyond our ability to comprehend. 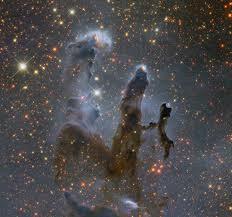 They are called the Pillars of Creation because stars are born within them. The name is intended to resonate with Christian belief. I have been trying to understand this sentence for over a week now. I am sure I am being too literal, but I am unable to grasp the poetic sense of what you are saying. I am assuming that since God “spoke” the creation into existence, that “words” are older than creation itself. Thank you, Father. That was very helpful.